Spain topped the list of countries that consumed the most gin in 2017 with 1.07 litres per person. Gin is a spirit that can trace its popularity to London, Great Britain between 1689 and 1702 during the occupation of the English, Irish and Scottish thrones by the then Dutch Republic’s leader, William of Orange. It is among the broad categories of spirits, whose major flavor is extracted from juniper berries. There has been a massive evolution of this spirit which started out as herbal medicine. Gin has its historical origins in Dutch culture. Upon its introduction in England, its consumption rose significantly as a result of heady duties imposed to spirits’ import and authorization of unlicensed gin production. Gin production and consumption has since become widespread across the globe, especially across Europe and North America. As from 2009, there exists a World Gin Day which is observed every second Saturday of the month of June. The top ten countries with the highest consumption of gin are from only two continents; Europe and North America. Europe has an immense consumption, with 8 of its constituent countries appearing in the top ten list in 2017.For North America, the United States and Canada are the only countries featured in the top ten countries that drink most gin in the world. 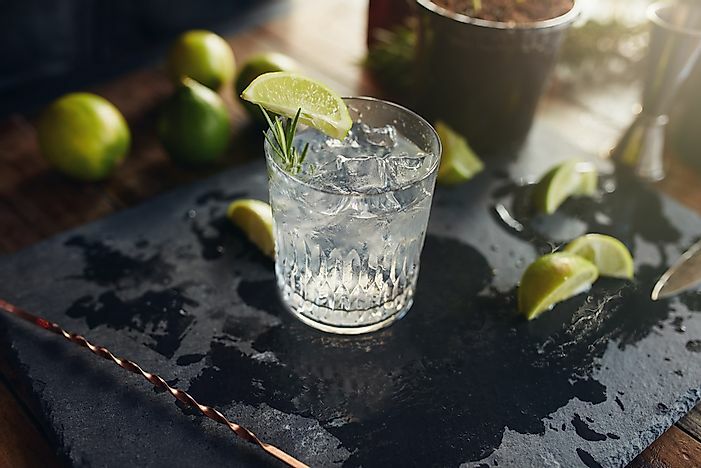 The revenue collected in the European continent from gin utilization is US$ 2.718M while from North America it is US$1.929M by the year 2018. Spain topped the list in 2017 showing a relatively high consumption rate of 1.07 litres per person. The Beefeater brand is the most widely consumed in Spain. Several factors have been attributed to this high consumption. These include a considerable unemployment rates and status for the Spanish people and the artistic nature that gin is presented and celebrated. In Spain, there are retailer outlets that exclusively deal with gin sale to consumers raising the spirit’s popularity among people. The United Kingdom is the 4th largest consumer of gin as outlined in the 2017 report with 0.55 litres per person. Gin was made popular during the Glorious Revolution by the Dutch. The other European top consumers of gin are Belgium, Netherlands, Ireland, France, Italy and Germany whose consumption rates in 2017 were 0.73, 0.63, 0.36, 0.19, 0.14 and 0.08 litres per person respectively. The United States had a rate of 0.21 litres per person. It has the highest revenue resulting from gin consumption, which is US$1.745M. Most gin consumed in the United States is of Spanish origin. Canada took the 6th position with 0.22 litres per person. A high gin consumption is a subject of a country’s heritage and the production rate. In Europe, gin is consumed by most people in a recreational manner as a way of belonging. Gin originated from Europe and was discovered and popularized by the Dutch which makes it some form of a European heritage. Spain produces a lot of gin, which is the likely reason for the high consumption rate. Availability of favorable policies and capital for gin production and trade is vital. This, coupled with the amount of revenue collected maintains the relevance of gin as a liquor.